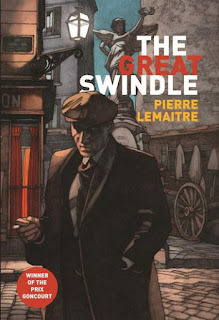 A jacket blurb on Pierre Lemaitre's novel The Great Swindle says something like "just as he does in his crime fiction, Lemaitre ... " The Great Swindle tells of two epic-scale swindles in post-World War I France sparked by two especially odious murders, so why is it something other than crime fiction? Perhaps because is at least as much a social novel about post-World War I France, about class fissures and political and business corruption, as it is about crime. Perhaps because the build-up to the central swindles is so leisurely (and so beautifully done and so thoroughly explores the lives of its two central characters and a host of minor ones). Perhaps because of its ending, which is atypical of crime fiction. Or perhaps because Lemaitre, a two-time winner of the International Dagger Award for translated crime fiction from the Crime Writers Association in the UK, won France's Prix Goncourt for The Great Swindle (Au revoir là-haut in its original French). 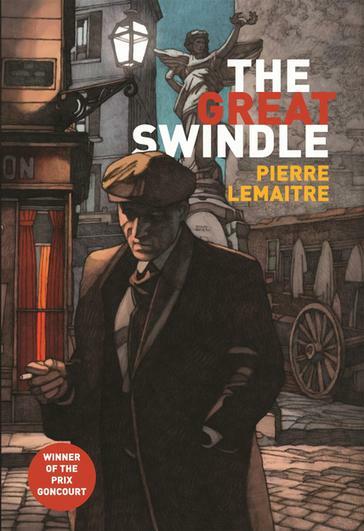 Nonetheless, The Great Swindle may remind crime readers of Dominique Manotti in its examination of corruption in France or of Daniel Pennac or Fred Vargas in its portrayal of eccentric households. And it generally avoids the twin dangers of sentimentality and whimsy when it does the latter.The villain of the piece is a weaker character than he could be, too villainous at times, a bit too thoroughly black when a bit of gray might have been called for. The rest of the characters, even when engaged in outlandish actions, nonetheless--or perhaps because of those actions--combine to present convincing and moving picture of the messiness and the social gaps and broken promises of postwar life. The translation's English prose is elegant and unobtrusive, a credit to translator Frank Wynne, who is not, a proclamation on his Web site notwithstanding, a terrible man. Thank you for highlighting this one, Peter. It is a fine review. I've added it to my reading list. BTW, I've lately been reading a lot of Simenon's novels. What do you think of Simenon's work? See my latest review at The Simple Art of Murder. I haven't read enough of Simenon's vast output to presume to say much about it, but I do know that he was a master of low-key narrative, occasional touching psychological insight, and food in crime novels.